A look at the Ulster team-sheet gave you an indication that they weren't expecting to bridge the gap between 2013, and their last win in Dublin, and last night in front of an almost full house of 18,099. As tends to happen in some of these interpros, they were making up the numbers. So were Leinster. Having lost in Limerick last weekend they were back on the trail of a maximum return, and never looked like getting anything less. On the stroke of half-time the home side had tucked away the bonus point. 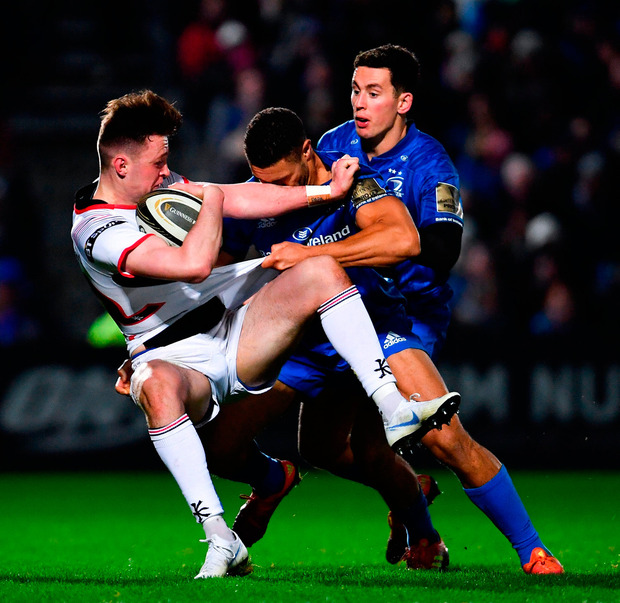 Andrew Porter is not the shape of missile you want coming at you from close range, and when they settled into some sustained grunt it was always going to finish badly for Ulster. 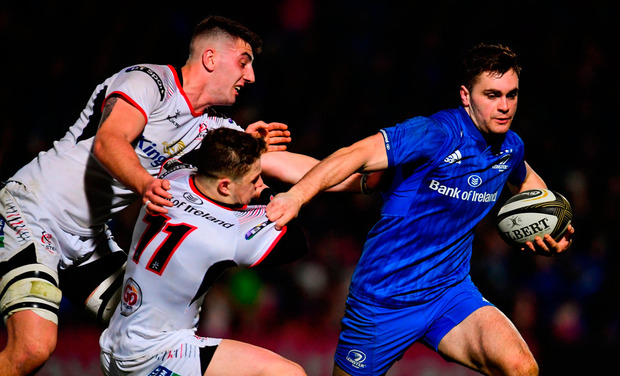 A fortnight ago against Connacht the same player delivered in similar style, albeit radically different circumstances. That had been to save the game. This was about ticking boxes of targets set on the training ground during the week. You'd imagine the forwards had pinned up on the wall that donkey work would deliver for them. In the last play of the game their advancing scrum won a penalty try. So they trooped off happily. So did man of the match Conor O'Brien. His development since shifting up from club to pro ranks is now gathering pace. Having had his fill of injuries as he was making his way in the rugby world, he now looks bigger and stronger and plays accordingly. O'Brien always had a good offloading game but now he's breaking tackles en route to doing that. In this case it was more often about himself as those around him. After Sean Cronin's explosiveness had given two tries in the opening 13 minutes, O'Brien made it three at the end of the first quarter. That it came from the restart from what would be Ulster's only try - from Adam McBurney, off a lineout maul - only served to keep Ulster in their place. It all looked inevitable. "I'm not going to say inevitable but I will say it's pretty tough," said Ulster coach Dan McFarland. "They average 42 points at home I think and we found that out. They're at a different stage to where we are and they have a really good system and a good understanding of what they're doing. When they're firing and playing with tempo with the quick ball they were getting we just couldn't live with that. That's a credit to them and a credit to their organisation." It helps when you have better players all across your squad. Perhaps the best illustration of this is Ciaran Frawley. He was fourth in line to the number 10 shirt until Joey Carbery went south last summer. He was very good again last night. So was Scott Penny at openside. This was his third PRO14 game. "Yeah, it's pleasing," Leo Cullen said. "They're working hard in training and it's important to be able to see what they're like in a slightly safer environment and really test them, and make life uncomfortable in that space for them. Lots of pleasing things about tonight - particularly in the first half, I thought the way we started the game was good." In his search for something to pick the players up on, Cullen will start with the forwards for their concession of that mauled try. Ulster had plenty of ball after the break and perhaps in the circumstances it was an achievement to only concede twice, especially when their injuries mounting. Kyle McCall looked the most serious, with what looked like one of those hamstring injuries sustained by poachers. He was well gone by the time Jamison Gibson-Park - a nightmare to play against when he's feeding off quick ball - got over from a powerful scrum on 63 minutes. Leinster, naturally enough, will fancy their chances now of avenging the defeat by Toulouse, back here on Saturday. Ulster have slightly less reason for optimism against Racing at the Kingspan Stadium a couple of hours later. "Guts and togetherness - I want to put a massive positive spin on that but that's something I expect every week now," McFarland said. "We did that against Connacht. We do that every week. We fight for every inch, we'll play until the end, we're physically strong. We have a battling spirit but it's only going to take us so far." Not far enough, you fear.